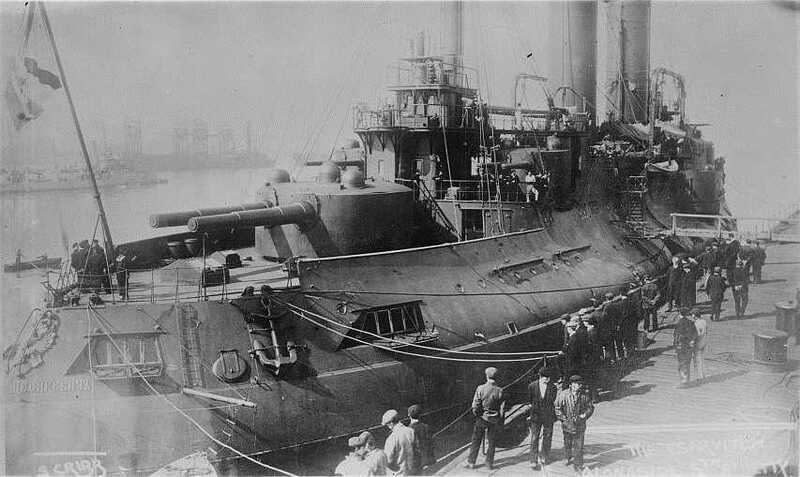 Battleship Tsesarevich about 1900. Admidships turrets hold twin 6"/45 (15.2 cm) guns. 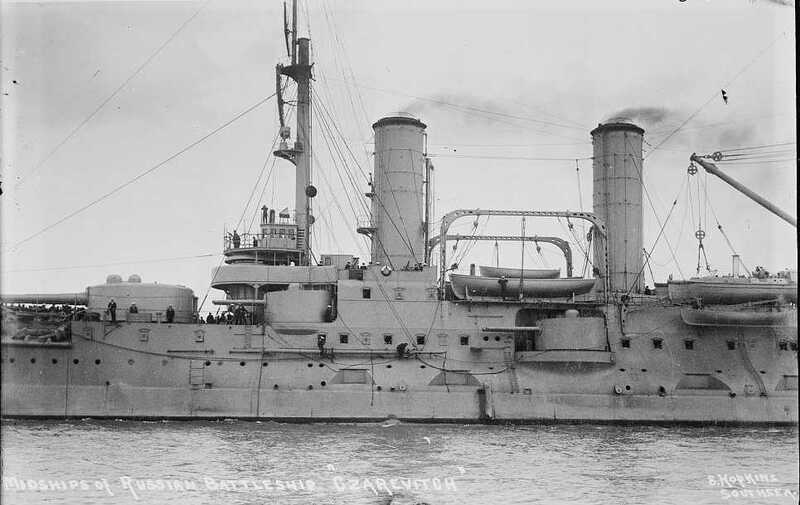 Caption reads "Midships of Russian battleship Czarevitch." Bain News Service Photograph as Library of Congress Photograph ID LC-DIG-ggbain-16925. These were the first modern heavy guns in Russian navy and were built to a Obukhov/Canet design. They were modified after the Russo-Japanese war to decrease the loading time. 68 guns were originally built and in 1914 additional guns were ordered from Britain and Obukhov to replace worn-out older guns. Apparently none were completed by Britain but 20 new guns were completed by Obukhov. When the Russian ships were decommissioned their guns were removed and put into storage. Six of these guns were later put on railroad mountings and stationed in the Far East. The Russian battleships Orel (also spelled as Oryol) and Retvisan were captured during the Russo-Japanese War and then served as Imperial Japanese Navy battleships Iwami and Hizen, respectively. These cannons used a lanyard for firing. "Old Model" AP shells lacked a cap. APC was introduced in 1894 but these were so expensive that few were available at the time of the Russo-Japanese War. Bursters were wet gun-cotton at this time. Black powder was still in use during the Russo-Japanese War. Some ammunition was manufactured in the US during World War II. It should be mentioned here that the maximum ranges listed in these tables were of little use at the time these ships were built. Fire control systems and rangefinders capable of allowing accurate firing at ranges over 10,000 yards (9,140 m) were nonexistent. The Russians estimated that a ship firing a four-gun broadside under ideal conditions (daylight, good visibility, target at a constant range) had a 40 percent chance of making a hit at 4,000 yards (3,600 m) and a 10% chance at 10,000 yards (9,100 m). Data is from "Gangut" Issue 7 article for these guns vs. KC-type Armor. This projectile was in use during the Russo-Japanese War. Turrets were electrically powered and followed contemporary French designs. Hoists were single stage from the magazines to the rear of the gun breeches. Stern turret on Tsesarevich about 1900. Caption reads "The Tsar[e]vitch alongside 5th [...] Jetty." Bain News Service Photograph as Library of Congress Photograph ID LC-B2-2903-14. 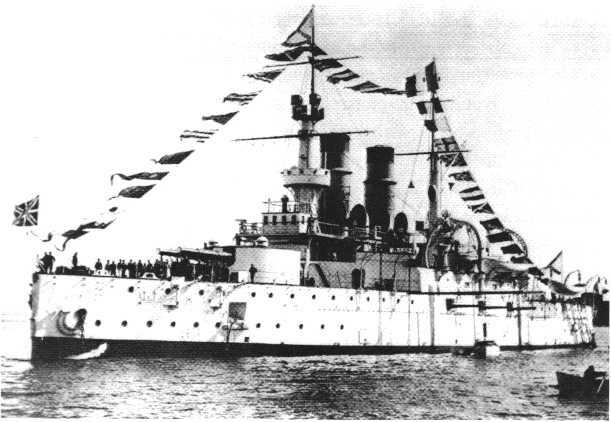 Imperial Russian Navy Battleship Sissoi Veliki. Sissoi Veliki was the first modern pre-dreadnought in the Russian Fleet. U.S. Naval Historical Center Photograph # NH84780. "The Retvizan: An American Battleship for the Tsar" article by Stephen McLaughlin in "Warship 2000-2001"